Within the port there are three modern cruise ship facilities, the original at HafenCity in the re-developed old warehouse area and since 2010 a second at Altona in the re-developed area of the old fish dock. The Hafen City terminal is within walking distance of the downtown area of Hamburg. Since 2015 The Cruise center 3 is also in operation in the port area of Steinwerder, right in the heart of the Port of Hamburg. The berth at Kronprinzkai is able to accommodate the next generation of cruise ships can dock there. Bus stop about 500m away from the terminal. The Water bus stop is nearby (not on weekends). Shuttle buses will drop you off at the S-Bahn Veddel. No large luggage allowed. A Taxi in this case might be your best bet. Some large cruise ships are using the Altona Terminal. It is not within walking distance to town, but has a very good water bus connection (#62) to the Landungsbrucken wharf, where all hop on/off buses are as well as harbor tours are starting. The Water bus stop is only 20 meters from the aft of your ship and goes every 15 minutes in day time and every 30 minutes till' midnight. 1.30 euro per trip or 6 euros for all day including all other transportation in Hamburg. The water bus in it self is already a nice site-seeing boat, and a full round trip is fun! Most cruise lines also run shuttles (10 Euro), to the central station. Taxi is about 13 euro each way. Distance to Hamburg Airport (Fuhlsbüttel): 9.5 km. The s-bahn train station is located directly below the airport terminal and the trains depart every 15mins. The journey to the main train station in the city center takes about 20 min's, to Altona station about 15mins. Cruise calendar for Hamburg and where you will be docked. Map of the terminals. Cutting through the middle is the Alsterfleet, a canal that separates the Altstadt (Old City) from the Neustadt (New City). Feeling lost? Look out for the bronze, helmet-shaped Michaeliskirche, an easily seen landmark, south of the city center. Hamburg is best visited in spring or summer. A typical Hamburg visit includes a tour of the city hall and the grand church St. Michaelis (called the Michel), and visiting the old warehouse district (Speicherstadt) and the harbor promenade (Landungsbrücken). Sightseeing buses connect these points of interest. Tourist offices are at the train station and at the harbor at St. Pauli Landungsbrücken between jetty 4 and 5. From Landungsbrücken you can make boat tours into the harbor. These Hafenrundfahrten are available from various companies and take around an hour. Big ships provide more comfort, but smaller ships also go though the Speicherstadt. Both are well worth the money. Inquire about English language tours (Often at noon time). 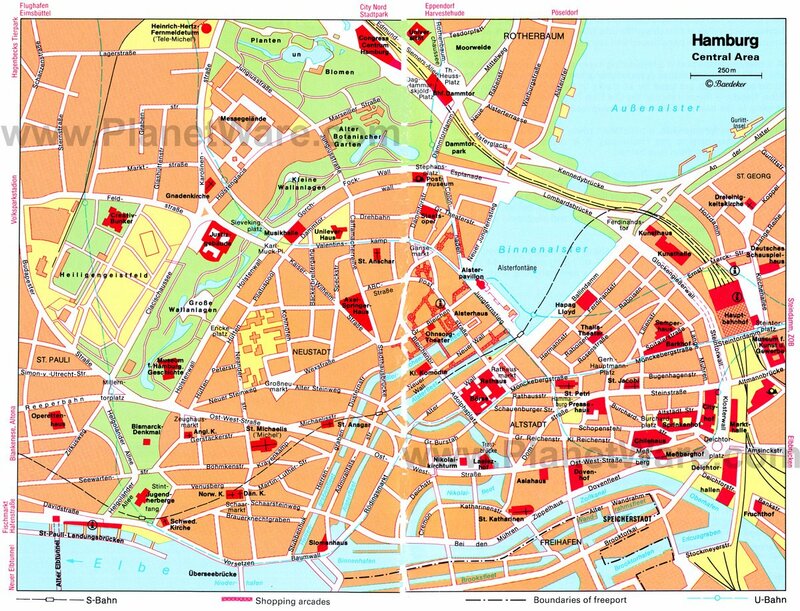 Take the s1,s2,or s3 to Jungfernstieg, the lively center of Hamburg on the Alster. or take the u3 to Baumwall to Hafencity, currently Europe’s largest inner-city development project – is a blueprint for the development of a European city on the waterfront. For a visit with an eye cast towards the past, have a look around the Speicherstadt. The listed buildings now house leisure activities such as the Minatur Wunderland with fascinating toy railway worlds, and Hamburg Dungeon. Museums can also be found in the Speicherstadt. There is German Customs Museum (Deutsche Zollmuseum), which tells the tale of customs and smuggling in Hamburg, or the International Maritime Museum with thousands of ship models and nautical charts. Many cruise lines offer excursions to Berlin, a rather long trip. Check the weather forecast for Berlin before you book. Berlin is stunning on a beautiful day! The main shopping area of Hamburg is the Mönckebergstraße in the center of the city. Take the subway to either central station, Rathaus (town hall) or Mönckebergstraße. Also check the side-street Spitalerstraße. West of town hall towards Gaensemarkt are the more pricey shops like Hugo Boss. Shops are mostly open from 10AM to 8PM and to 10PM on Thursdays and Fridays. German spoken. Germans are regarded as being punctual, disciplined and last but not least, a li ttle formal. In German there are two forms of you: "Du" and "Sie." "Du" is less formal, "Sie" is more so. You almost always should use the "Sie" form and someone's last name with people you don't know. Large bookstores such as Thalia have internet facilities, as well as many cafes etc.